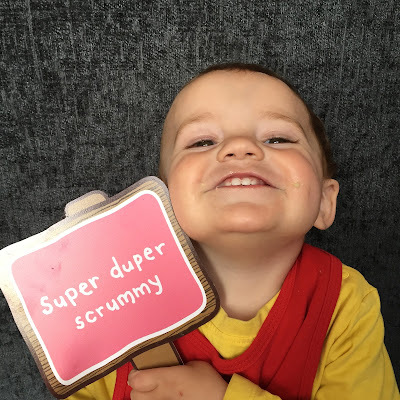 Joseph was sent a pack of each of the four new flavours as well as his very own bowl, spoons and a personalised Ell's Kitchen bib. We also received some cute signs so Joseph could show exactly what he thought of the cereals, were they really #CerealouslyScrummy! So, we started off trying Joseph on the Banana multigrain baby rice as this one is suggested from 4 months so ideal for those first tastes. 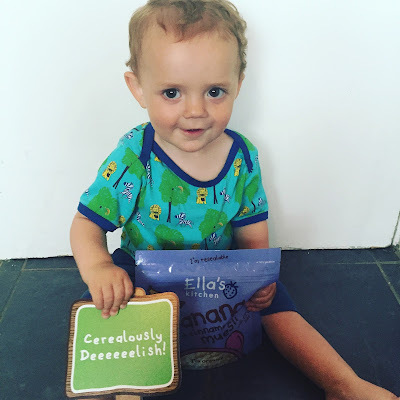 Made with organic banana, maize and quinoa baby rice, Joseph loved the soft texture of this cereal and banana is always a winner in our household. The Carrot multigrain baby rice is also suitable from 4 month old and gives little ones that first veggie taste. Joseph wasn't as keen on this one as I think he was expecting the sweetness like from the others, but still did eat bits. I guess this one may have been more suitable if he was younger and trying out his first taste of solids. 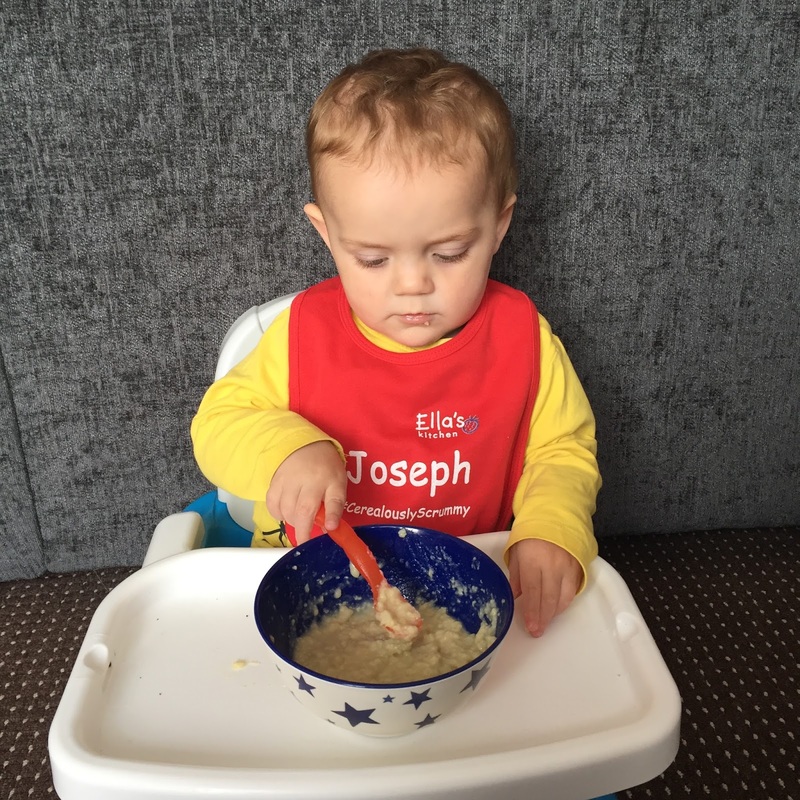 When it came to the turn of the Strawberry and raspberry porridge with crispy bits, Joseph wolved it down a treat. This organic scrummy maise, oats, strawberry and raspberry porridge has little rice crispy bits and a good hearty texture to it. And again, with banana being one of Joseph's favourite fruits, it wasn't a shocker to see that the Banana and cinnamon muesli with crispy bits was his favourite of the packs. Having a thicker texture and some yummy crispy bits, Joseph enjoyed feeding himself this one, even if he did make a mess trying to shove in as much as he could. 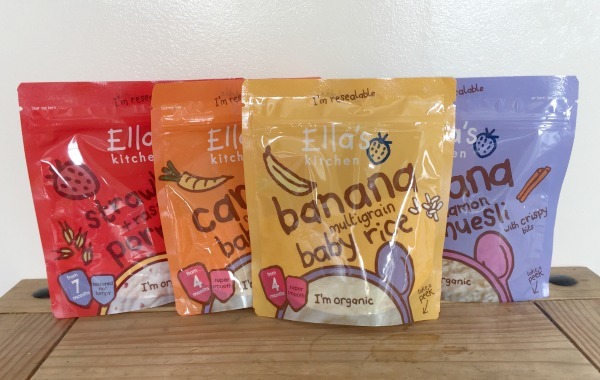 Overall, I think the new Ella's Kitchen cereal range has a lovely choice of flavours and textures. Joseph much preferred the ones more suited to his age and the flavours they offered. 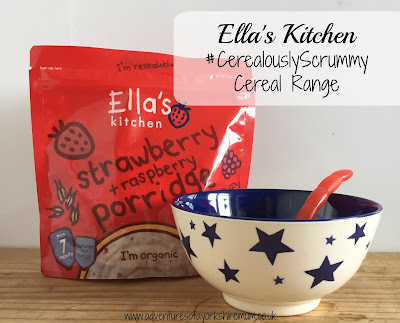 So, we decided that the Ella's Kitchen range really are #CerealouslyScrummy!